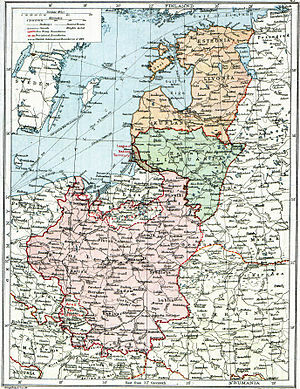 ^ This "Landesrat" on April 12, 1918, decided to beg the King of Prussia and German Kaiser to accept the throne of the Grand Duchy of Livonia Bilmanis, Alfreds (1945). Baltic Essays. The Latvian Legation,. http://books.google.com/bkshp?hl=en&tab=wp&q=%22This%20%22Landesrat%22%20on%20April%2012%2C%201918%2C%20decided%20to%20beg%20the%20King%20of%20Prussia%20and%20German%20Kaiser%20to%20accept%20the%20throne%20of%20the%20Grand%20Duchy%20of%20Livonia%22. ^ Roeder, Philip (2007). Where Nation-states Come from. Princeton University Press. pp. 119. ISBN 9780691134673. http://books.google.com/books?id=XAItI5C_JPUC&pg=PA119&dq=%22Grand+Duchy+of+Livonia%22&lr=&ei=S7UMSf5vkdoxufGdlQQ. ^ Royal Institute of International Affairs Information Dept (1938). The Baltic States. Oxford university press. http://books.google.com/books?q=%22+included+the+creation+of+a+Duchy+of+Courland+and+a+Duchy+of+Estonia+and+Livonia+in+personal+union+with+the+Crown+of+Prussia%22&btnG=Search+Books.